Dedicated to those airmen who did not return. 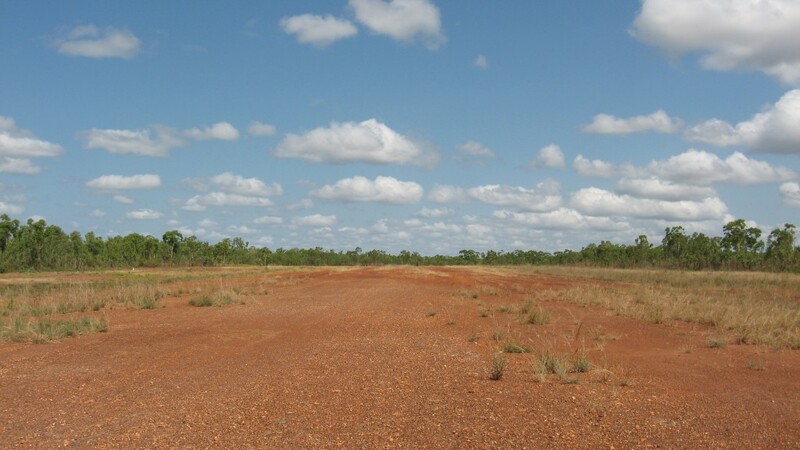 Gould Field is located to south of township and airfield of Batchelor and is situated on private property adjacent to the old North Australian Railway (NAR) permanent way. 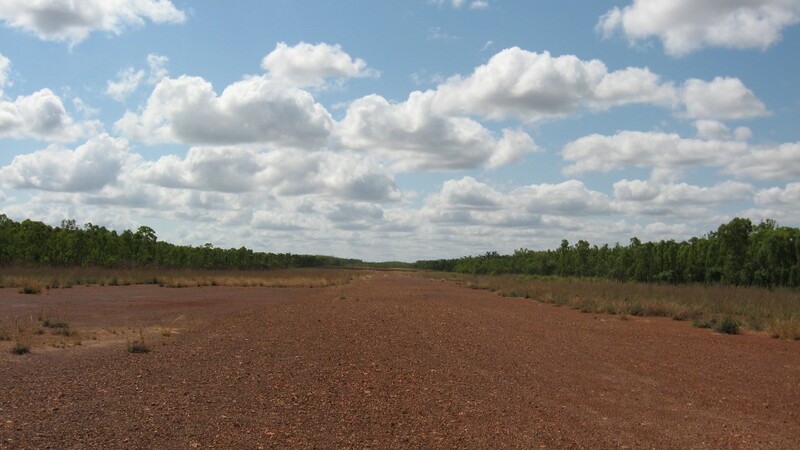 The airfield and surrounding taxiways and hardstands were constructed by units of the 3rd and 9th Mobile Works Squadrons (MWS) RAAF in late 1943. David Wilson (1998). 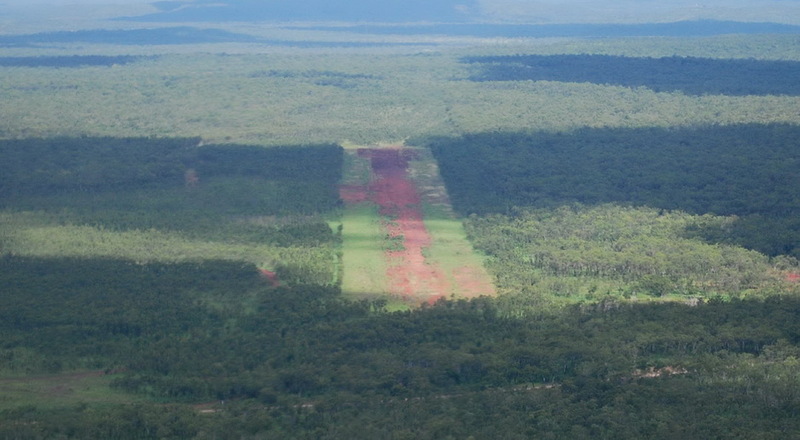 The taxiways of the Gould interconnected with the southern taxiways of Batchelor and it appears that aircraft from latter field shared at least some of the hardstands located at the former. 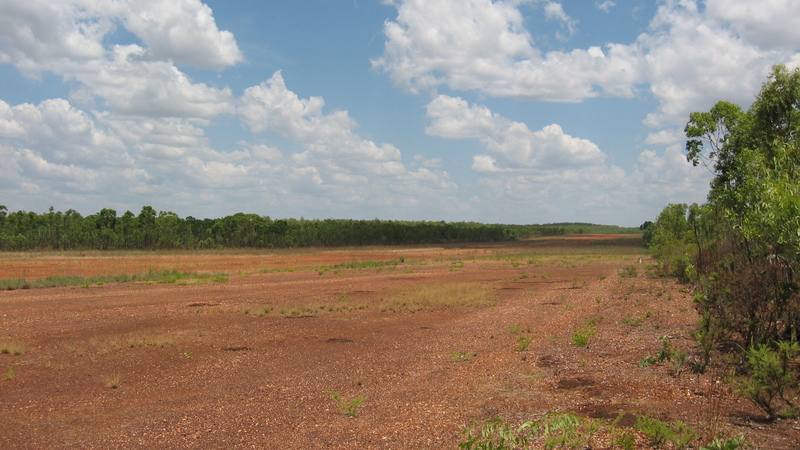 The airfield was well supplied by the NAR and Simms siding was located close to the northern end of the airfield and was used for the offloading of supplies. 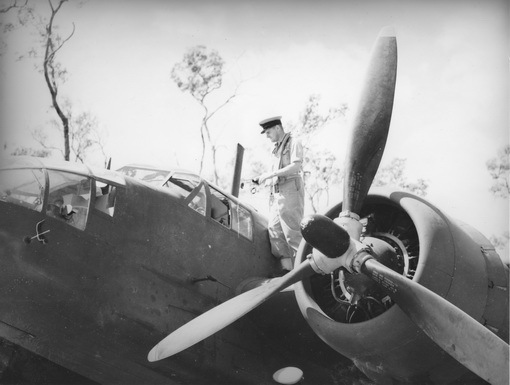 Number 1 Squadron RAAF equipped with Bristol Beaufort aircraft took up residency at Gould in early 1944 and flew operations from the field for approximately 6 months. 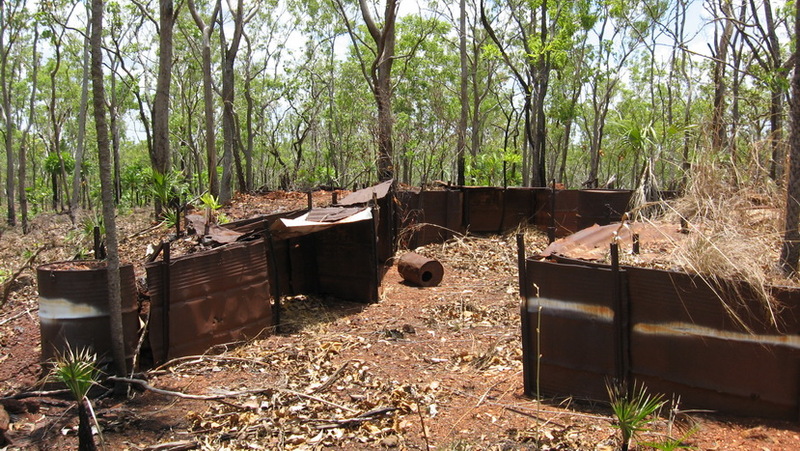 Number 1 Squadron RAAF base camp is located to the west of the airfield and a century post can be found guarding the perimeter of the camp site proper. 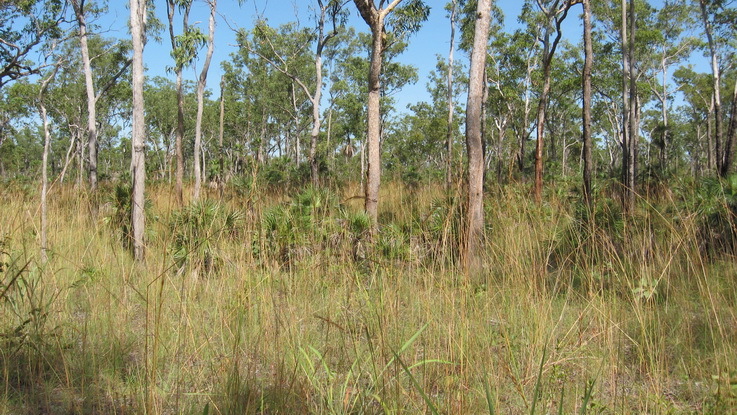 This camp is on private property today and permission is required to view the site. Multiple light and heavy anti-aircraft emplacements dot the perimeter of the field and most are in good condition for their age. Looking towards the Southern end of the strip from its Northern end in 2008. Looking towards the Northern end of the strip in 2008. One of the many hardstands located at Gould Field in 2008. There are many Light and Heavy AA emplacements located within the vicinity of Gould. 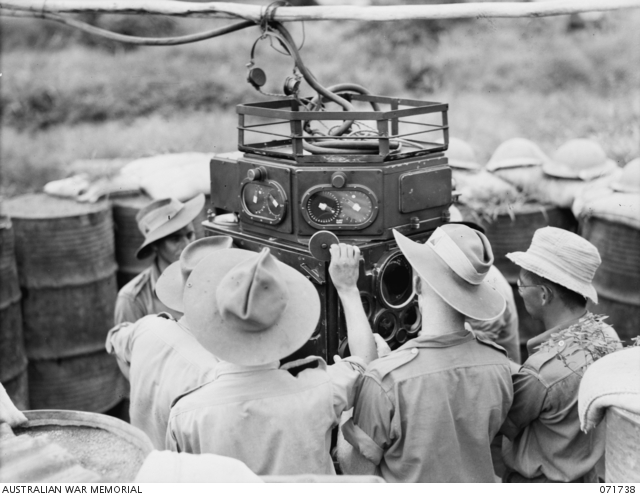 Some of these emplacements are connected with Batchelor and others are specifically tied with the defence of Gould. Many smaller machine gun emplacements can be found in and around the taxiways and hardstands to provide protection for the parked aircraft from strafing attacks. The emplacements that are directly related to the defence of Gould can be found on small hills in the area to provide some elevation for the guns. 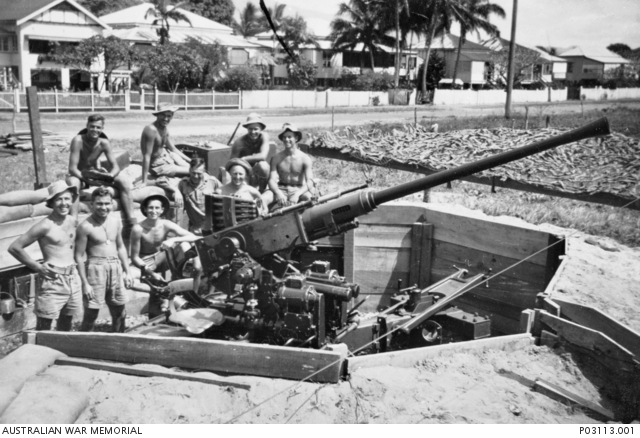 The first dedicated AA units to occupy Gould was that of the 3.7″ guns of ‘A Troop’, 134th Australian Heavy Anti-Aircraft (HAA) Battery of the 54th Australian AA Regiment (AIF) and the 40mm guns of ‘A Troop’ 153rd Light Anti-Aircraft (LAA) Battery in January of 1944. 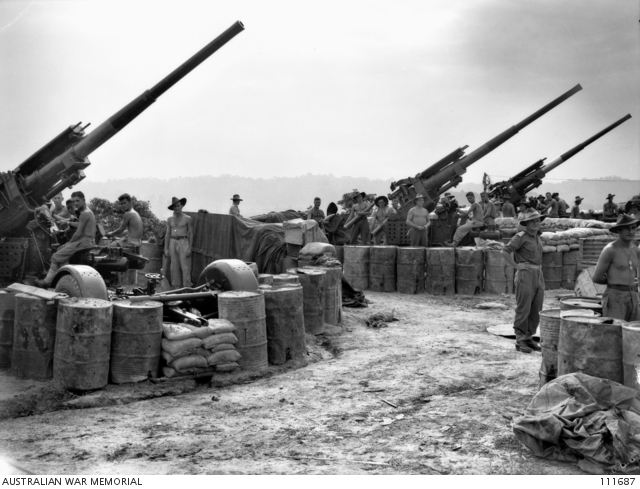 The guns of the 134th HAA were complimented in May of 1944 by the 3.7″ guns ‘A Troop’, 136th Australian Heavy Anti-Aircraft (HAA) Battery of the 55th Australian AA Regiment (AIF). In July of 1944 soldiers of ‘A Troop’ 149th LAA replaced the soldiers of the 153rd LAA and the 134th HAA moved out from their positions and returned to Hughes field, leaving the heavy anti-aircraft defence of Gould Field solely to the troops of the 136th HAA. In August of 1944 the final AA unit arrived at Gould. 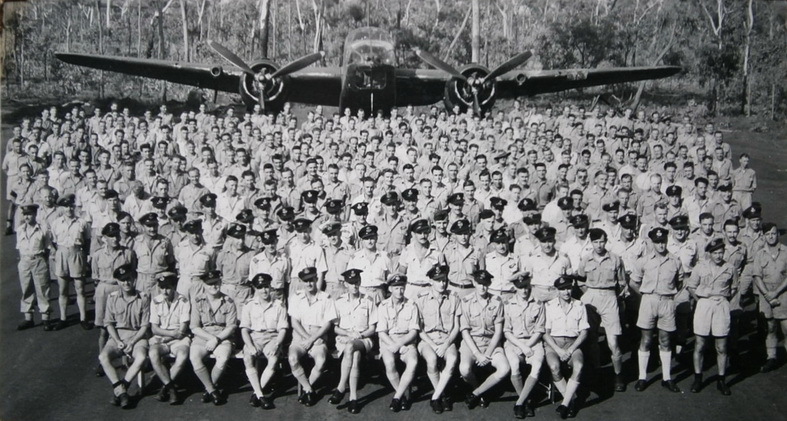 This was ‘B Troop’ of the 232nd LAA Battery which replaced the ‘A Troop’ 149th LAA and was to occupy positions around Gould until December of 1944 when both it and the soldiers of the 136th Australian Heavy Anti-Aircraft (HAA) Battery departed. No further evidence of AA troop movements into Gould field have been found. 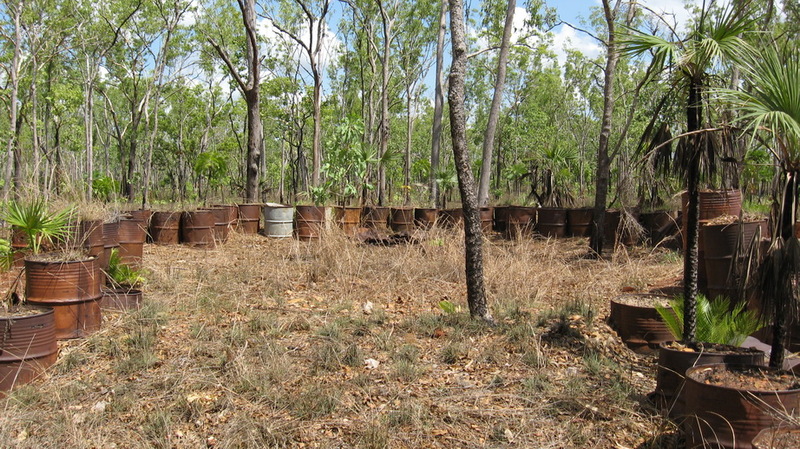 A QF 3.7 Inch emplacement constructed of 44 gallon drums at the southern end of Gould Field. This position was occupied first by units of the 134th and then the 136th HAA (AIF). 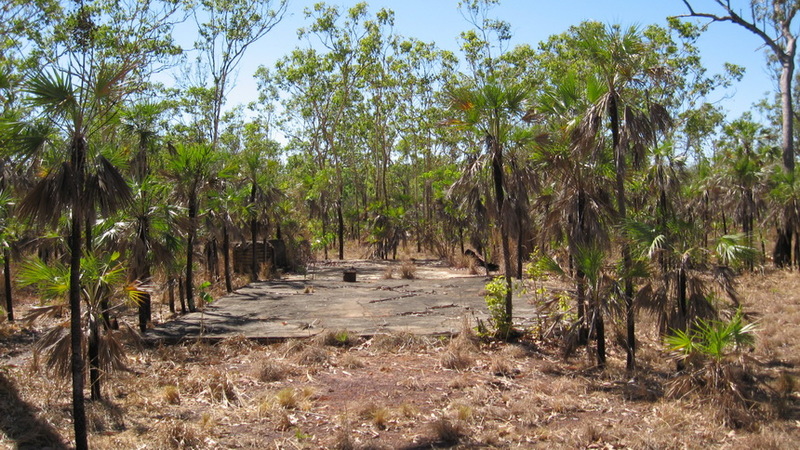 This emplacement is one of four sited at this location as was known as H1 with H2 being to the west of Batchelor airstrip. 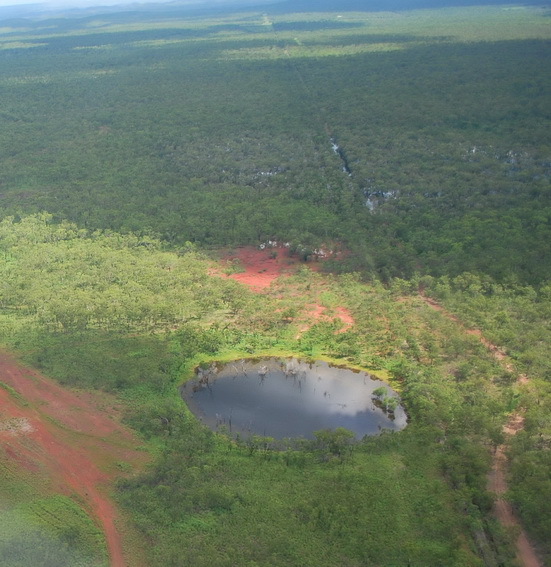 The location must have been constructed during the dry season some time after the arrival of the HAA units as this area can become quite flooded during the wet season. A view into one of these emplacements. Note that access has been left at the rear for the easy movement of the mobile 3.7″ AA gun. At the center of the AA emplacements can be found the fire control area which consisted of two hardened emplacements for both the range finder and the predictor. The range finder emplacement can just be seen at left and the predictor’s location at center. The fire control area has been raised above the ground and concrete has been used at the center to provide stability for the equipment. The position was known to have been equipped with radar for target tracking. A predictor in a hardened emplacement similar to that found at Gould. (AWM071738 – Copyright expired – public domain). Machine gun positions can also be found near the HAA emplacements to defend the 3.7″ guns from low level strafing attacks. A light or heavy machine gun would have been set up in the center. Click the play button above to see a short video of one of the HAA emplacements/fire control area and machine gun emplacements at this site. 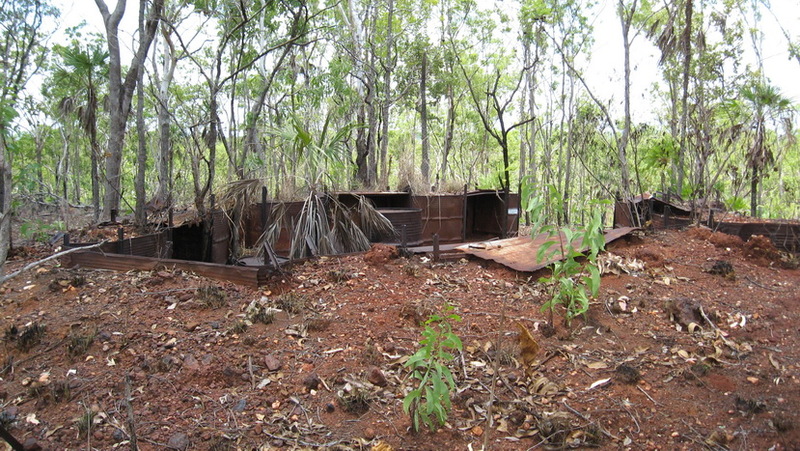 Along with the HAA emplacements at Gould, there are also several LAA emplacements as well. Some are scattered amongst the hardstands and taxiway areas and others are dotted around the field to provide for a more effective AA cover for the ingress and egress of enemy aircraft attack lanes. One of the best preserved LAA sites is situated on a hill and contains a very well preserved 40mm emplacement and a number of machine gun positions that surround it for close defence. 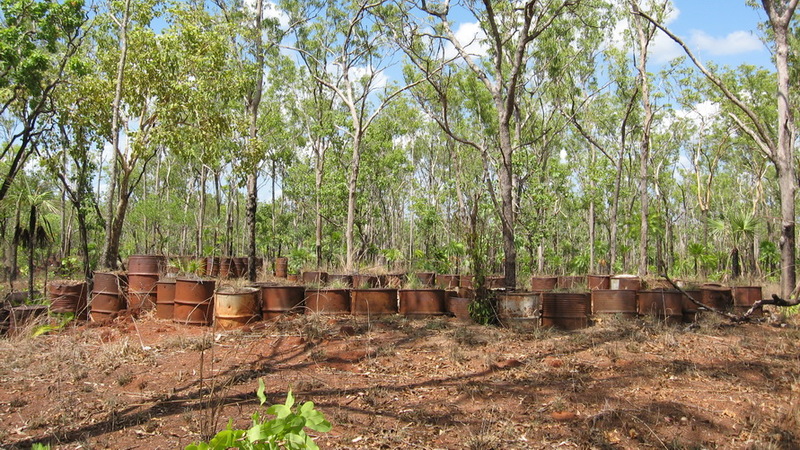 The LAA 40mm emplacement on top of a hill in the area, 2008. 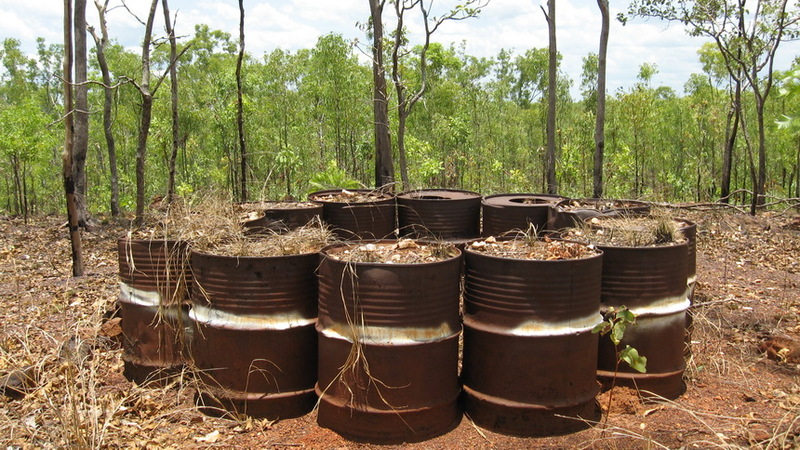 It has been very well emplaced with earth filled , and flattened 44 gallon drums forming the inner circumference walls with earth piled up around the outside for greater protection and to assist with camouflage. Looking into the position from the rear with the front of the emplacement facing away from the airfield in the expected direction of attack. A gap has been left in the rear to allow the movement of the 40mm gun into the emplacement. Note the use of star pickets to support the walls of the emplacement. 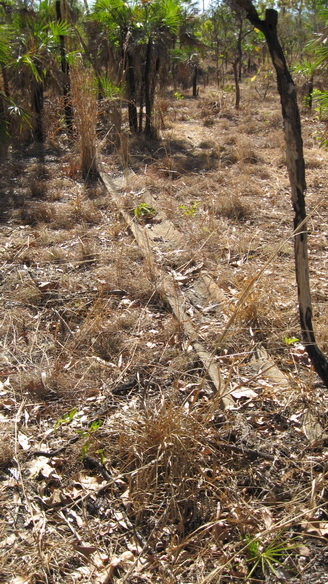 Most of the star pickets were manufactured in Waratah and bare this name along with BHP standing for “Broken Hill Proprietary Company Limited”. A predictor or range finder inset into the site of the emplacement. 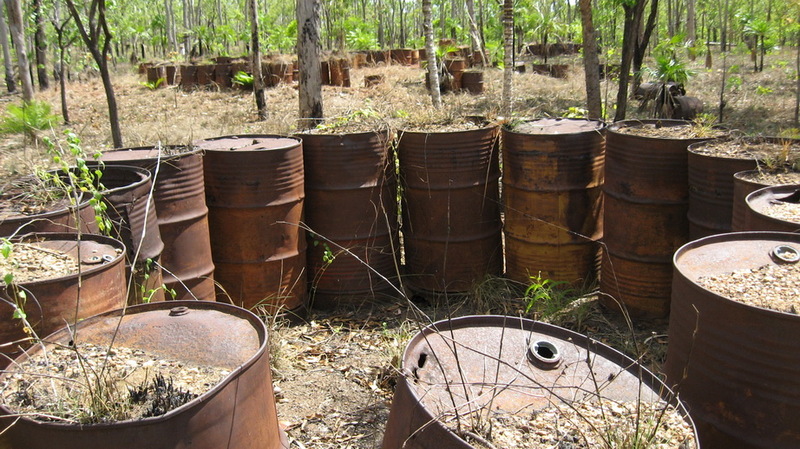 Note the use of flattened 44 gallon drums to serve as the walls of the emplacement. A magazine store for quick access to the 40mm ammunition. The magazines still had their crushed 44 gallon drum roofs and floors. A similar 40mm position can be gauged in this photo. 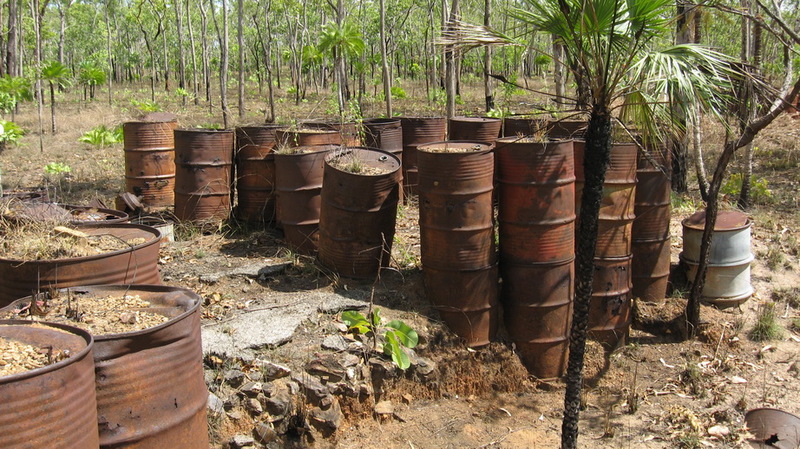 Although the design is the same, wood has been used in place of 44 gallon drums for the supports in this case. Note the predictor in inset at the rear of the gun and magazine stores at left. (AWMP03113.001 – Copyright expired – public domain). Click the play button above to see a short video of the 40mm emplacement. One of the machine gun emplacements that ring the 40mm position further up the hill. The white ring around the emplacement was painted on post war. The base camp area exists on private property and is only accessible with permission from the owner. 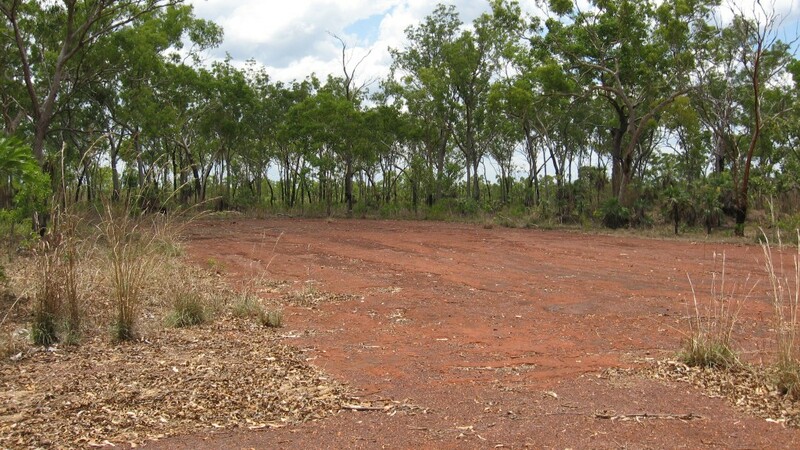 It is spread out over quite a considerable area and contains many concrete slabs and tent sites. 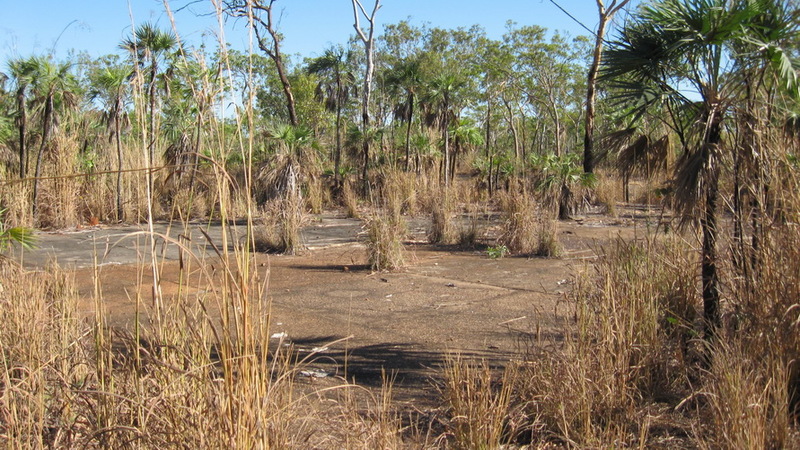 The area is quite overgrown with dense foliage and as a result most of the tent areas can only be recognized by the existence of clumps of sand palms and adjacent slit trenches. 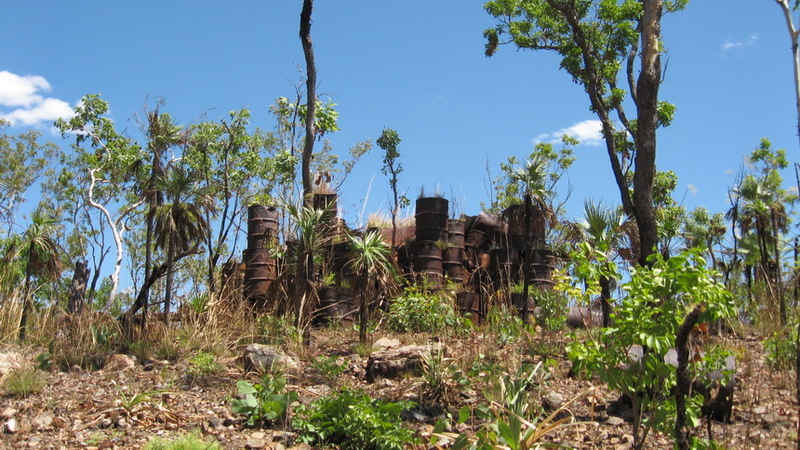 The most numerous building remains are that of shower, mess and cooking facilities with many stove bases present. Little information exists on this camp site and the author is currently seeking any information or photos pertaining to the dates of its construction and occupation. An Airmen’s tent site at Gould Base Camp today, 2014. Max R. Collins (88097) at the rear of the tent pictured above. Note the Indian Pattern design of the tent, the gas mask bag hanging at the ready at left and the sand palm with rocks neatly circling its trunk. Max was a prolific letter writer and missed many a picture show, writing long into the night. 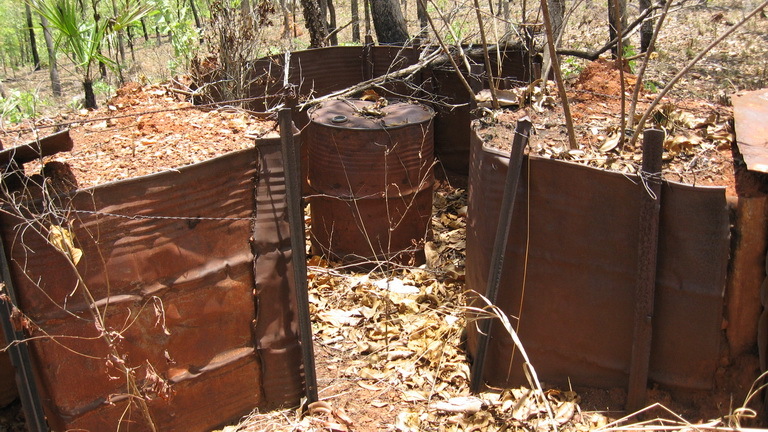 A guard post/AA site found on the outskirts of the base camp area. 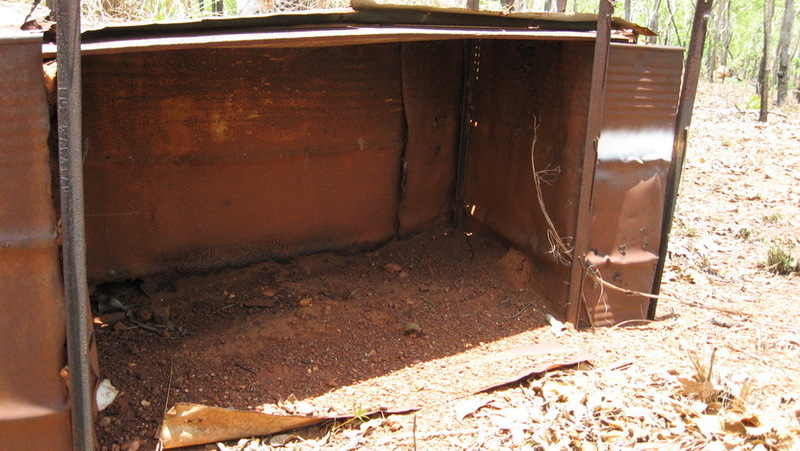 Thought to be the Sergeants Mess foundation located in the middle of the camp area. This is the biggest foundation on site. A stove/cooking area near the Sergeants mess. 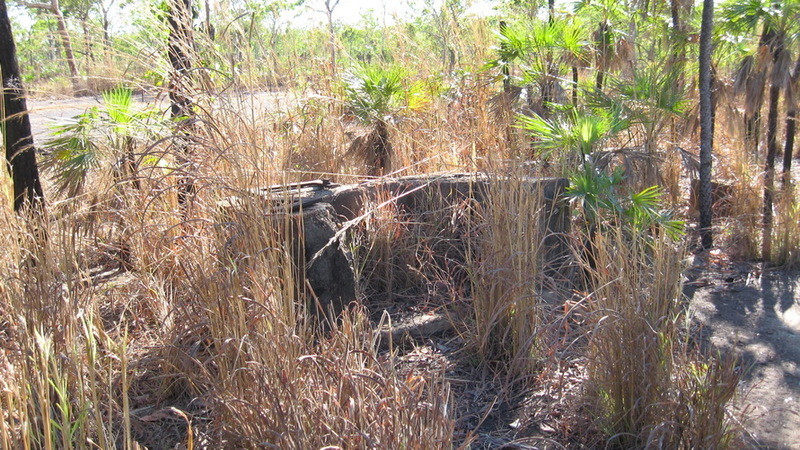 Note the overgrown condition of the site. Another mess area with cocking facilities at left. 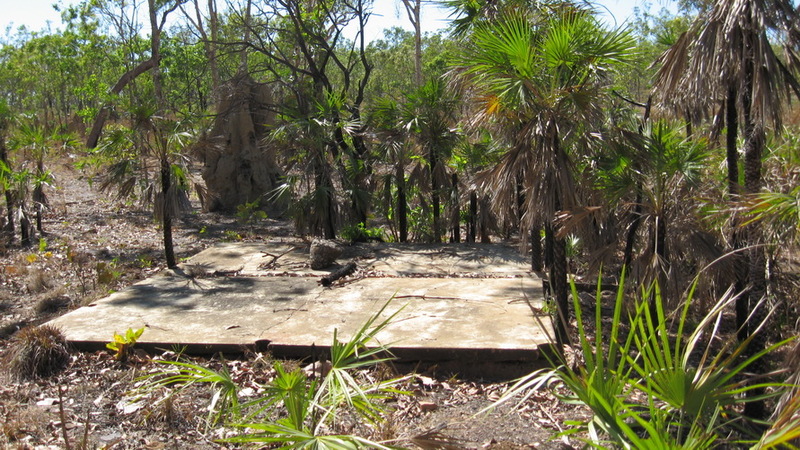 A shower slab in the southern part of the camp site. To the right can be seen the collection drain. Note also the post holes in the concrete. A shower collection drain running downhill from the shower slab. 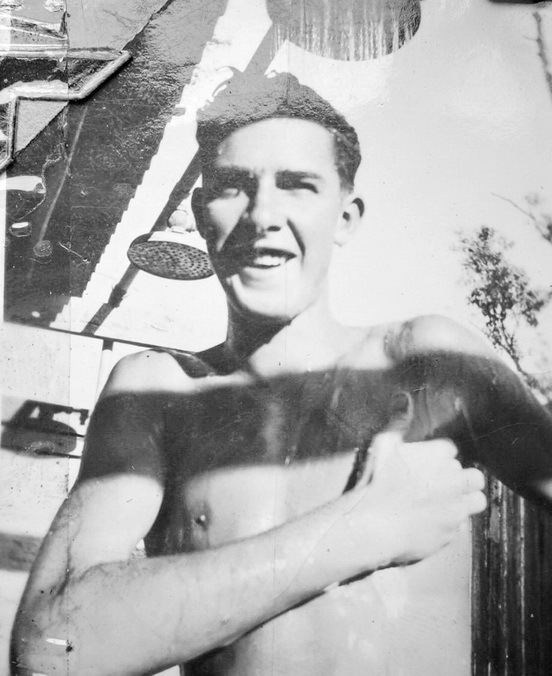 References: Wilson, D, Always First, The RAAF Construction Squadrons 1942-1974, Fairbairn, 1998.